Custom Three Coffee Cake Sampler for sale. Buy online at Zingerman's Mail Order. Gourmet Gifts. Food Gifts. Put together your own triple coffee cake gift box. We'll pack the three nosher-sized cakes you select in our handmade wooden cheese crate and ship it anywhere in the contiguous 48 states for free. Makes a great business gift. A fantastic centerpiece for your next brunch. Cakes also freeze splendidly for long-term munching. more to go. 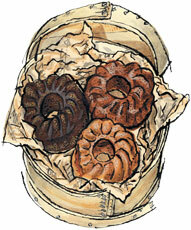 You have selected of coffee cakes. Click the plus sign + to select a coffee cake. Our most popular cake for over twenty years, loaded with toasted walnuts and Indonesian cinnamon. Made with extra-special cocoa and chunks of Belgian chocolate. With crystallized ginger, dark molasses, coffee, fresh orange juice and loads of winter spices. Made with real lemon oil and a passel of Dutch poppy seeds. Our sour cream coffee cake minus the walnuts and cinnamon. Moist crumb made with lots of sweet butter and topped with a butter-crumble crust.